What if every college student was required to take a class that covered budgeting, investing, and how to get out of debt? I wish more than anything that schools today would at least do one class on personal finance. It would be a game changer. The sad reality is that that will never happen. I was a finance major in college and in the 10 or so finance classes I took, none talked about personal finance. At best, we learned how to calculate rate of return and future value. Important, but not nearly as important as learning the basics of saving and investing money. My dream is for PF Geeks to become that go-to resource for college students and recent grads looking to make more, save more, and take control of their finances. I still think getting a college degree in your field is one of the best investments anyone can make. Even if you don’t learn the most relevant stuff to your everyday life, a college education makes a huge difference in your job opportunities and salary growth over time. But I desperately wish they would teach this one basic concept to students: your savings rate. At the end of the day, 90% of being “good with money” comes down to this metric. Your savings rate will play the biggest factor in how much you can save and how quickly you can grow your savings. The gap between your monthly income and your monthly expenses is how much money you’re able to save each month. If you take your monthly savings and divide it by your income, you can figure out the percentage of your income that you’re actually savings. Way too many people get caught up trying to figure out what all gets included in their savings rate. Do you use after-tax or pretax income? Increasing your savings rate by gaming the system won’t actually do you any good, even if it’s fun to play around with. The real key is to increase the gap between your income and your expenses. I don’t count any minimum payments towards debt because to me, those are fixed monthly expenses! But if we pay any extra towards our car loan or house mortgage, that would count! Anything we save towards retirement obviously counts, but employer contributions do not! Why is your savings rate so important? Before we dive into the challenge, I want to talk about why your savings rate is so freaking important AND why you should absolutely start tracking it. If you’re early on in your investing career then increasing the amount of money you are putting into the market is the most important factor in building wealth. Too many people focus on trying to increase their rate of return in investing when they would be far better off putting that effort into increasing their income or cutting costs. You see the key in your 20’s is to build up your savings as much as possible and as fast as possible. Compound interest is one of the most incredible things in the world, but the only way it can work in your favor is if you give it time to work its magic. If you graduate at 22, then you’ve got 8 years until your turn 30. 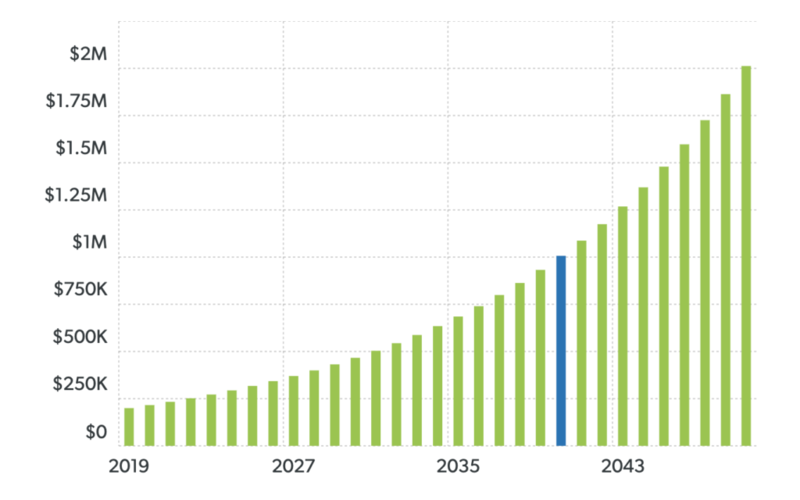 My personal goal is to get as much money invested by the time we turn 30 so that we’ve got plenty of time for compound gains to do the hard lifting for us. 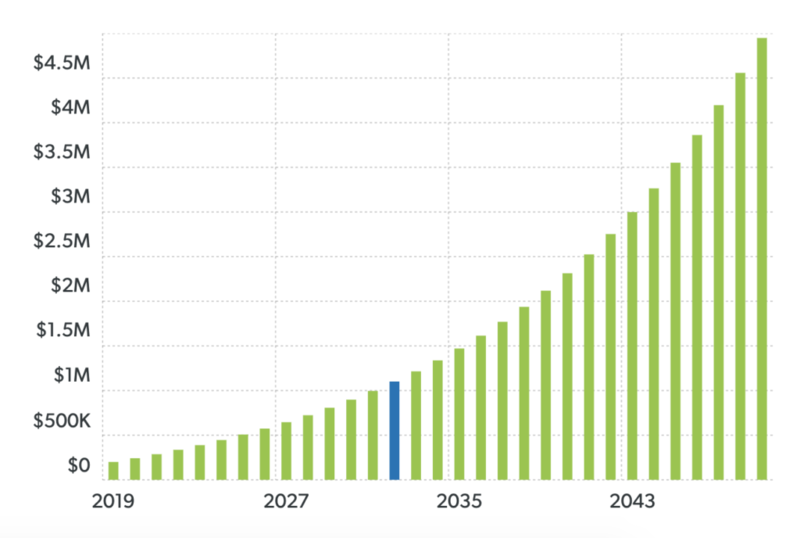 If we can get $200,000 saved by the time we turn 30, then that will grow to almost $2,000,000 by the time we turn 60 and that’s without contributing a single dollar. If we keep contributing $2,000/month then our nest egg will grow to nearly $5,000,000. Have you ever heard of the different between outcome and process goals? Honestly, it completely changed my perspective on life when I stumbled across this idea. When most people set goals, they are always focused on the outcomes that they are hoping to achieve. Whether it’s losing weight, paying off debt, saving for retirement, or writing a book. Each of those are outcomes they hope to achieve. The problem though is that these outcome goals might seem lofty and too distant for us to really set our minds on. We have to break them down to figure out exactly what it takes to get there. Processes are the actually daily steps needed to accomplish that outcome. Outcome: losing weight. Process: meal prepping & exercising daily. Think about your financial goals. Maybe you want to pay off all your debt, save up for a house down-payment, or invest for retirement. The key to reaching those goals is to focus on the process. And the process is having as much available cash as possible to funnel towards each of your goals. Increasing your savings rate is the single greatest factor in doing exactly that. 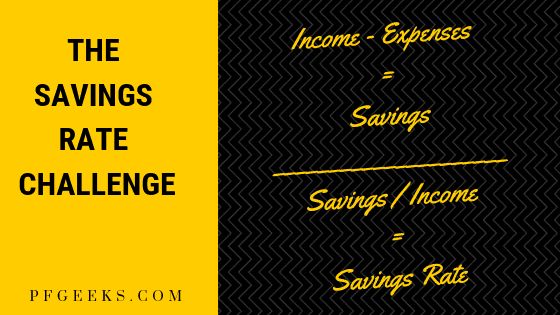 The higher your savings rate, the bigger the gap between your income and expenses. Let’s say you have combined income of $80,000 and are currently spending $60,000 a year. That means you’d be saving around $20,000 a year or a 25% savings rate which is pretty fantastic on an $80k income. But what if you found ways to increase your income to $85k while lowering your expenses to $55k. You’d have an extra $10,000 to invest every single year! Over a 10 year period, that’s an extra $100,000 put towards your financial goals. The way to put this into practice is to track your monthly spending. The more closely you can actually stick to your budget, the higher your savings rate will be! The goal for the challenge is simple. But it might be the most important step you make with your money. The goal of the Savings Rate Challenge is to increase the gap between income and expense as much as possible so that you can create more monthly cash flow. The bigger your monthly surplus, the more you have to put to work to reach your financial goals! If you really want to build wealth and jack up your savings rate, you’re going to have to make some lifestyle changes that will set you apart. The reality is that most people have hardly any gap between their income and expenses. Even as their income increases, their expenses tend to follow suit. Most people to keep up with everyone else around them and their lifestyles inflate. The end result is that you have people making great salaries, but struggling to get by. Most people are loaded with debt, struggling to get by, and have nothing saved in case of an emergency. The key to growing your savings is to keep your expenses down while your income continues to grow. 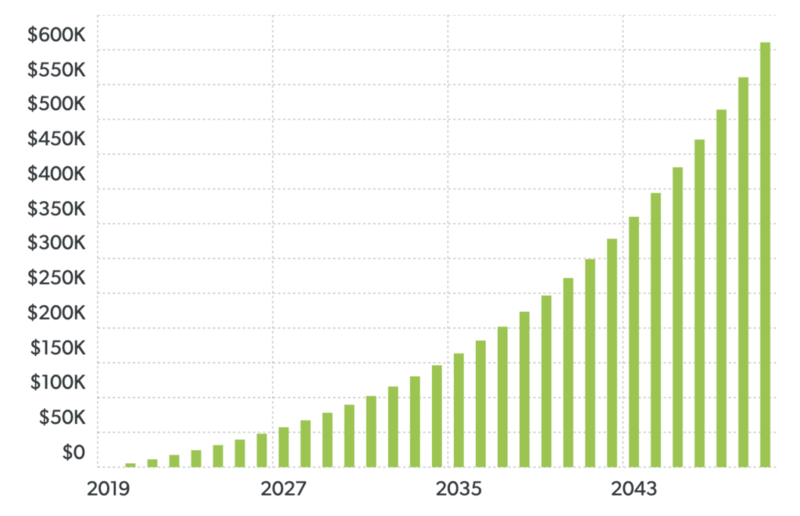 That entire green section in between is all the money that is working to help you reach your goals. Think about your dollars as soldiers. Each extra $1 you save is another soldier who can do work for you. The best part is, this $1 will continue to work for you for as long as you have it! If you want to get more of your hard-earned money working for you, then it’s time for you to join the Savings Rate challenge! The goal is to find ways to increase your income and cut expenses so that you can save as much as possible each month. Each month, you’ll try to increase this bit by bit! If you want to increase your savings rate, you need to focus on two numbers in the equation. Increasing your income will boost your overall cash flow and reducing your expenses will lower your monthly spending. There’s no limit to how high you can increase your income, but at some point there is no more you can cut from your spending–no matter how frugally you are willing to live. Cutting expenses is often the quickest way to boost your savings rate, but increasing income is the way to really ramp it up over the long-term. Let’s look at a few ways to increase your income and lower your expenses. The best way to increase your income is to find ways to maximize the money you make when you show up to work each day. The idea of “passive income” is attractive to all of us. It’s the subject of late night google searches and Facebook ads trying to get you to sign up for the latest webinar. Want to make money without more effort? Increase the amount you make for each hour you’re already working. Look, if you’re working 40 hours a week and making $50,000 a year, that’s a great start! But if you can increase that to $55-$60k, then that’s a great chunk of extra money you’ll be making without putting in more hours. That $5,000/yr raise will net you an additional $600,000 over a 30 year career if you invest it. That doesn’t even take into account the fact that most raises are a % based on your income. The higher your salary, the bigger your jumps will be. The next step in increasing your savings rate is to find ways to boost your income outside of your full-time job. There are a hundred reasons that a side hustle can be a great idea but increasing your income is definitely one of the biggest. The question though, is where do you start? What’s the best way to start making extra money? Normal questions to be asking. I wish I had all the answers, but I don’t. Right now I’m making an extra $500/month with freelance writing and another $250 or so from this blog. There are a million side hustles out there–just go ask google. 3. One-off: Gigs, selling stuff, etc. The last way to increase your income is to find one-off opportunities to bring in extra cash. This stuff can be a great way to get a kickstart on your savings. Services like Uber, Favor, Rover or other apps can be easy ways to start a little side gig. It’s another way that you’ll be trading time for money, but if you need the extra cash it might be worth it. If you have the knowledge in a given area, a more lucrative side gig might be tutoring. My sister made $100/hr doing english tutoring for international students! If you don’t feel like using precious free time to make extra money, then you can still get a little cash infusion by selling off old crap and furniture you no longer need. Check out craigslist, facebook marketplace, or other selling services to get rid of stuff and make a little money. When it comes to cutting costs, the first place to look are your “Big 3” expenses: housing, transportation, and food. If you’re trying to spend less, focusing on these 3 areas will get you about 80% of the way there. You could cut out wifi, coffee, netflix, and your gym membership and save around $150 a month! OR you could get a smaller apartment/house and keep all of the small luxuries. I call this downsizing your space to upsize your lifestyle. If you can save money on things like housing, then you can afford small luxuries that add a lot of joy and convenience to your life. Here are a few ideas for each of the Big 3. If you’re willing to invest in a programmable thermostat like Nest or Honeywell then you may be able to decrease your electricity bill anywhere from 10-30%. Drive less often: bike, carpool, etc. Meal plan every week using my list of 50 cheap meal prep recipes (all less than $2 a serving!). Use my favorite cashback app: Ebates–Read my Ebates Review before signing up! One of the most effective ways to increase your savings rate is to get rid of all of your debt payments. Any payment you’re making on your student loans, credit cards, car loans, or other forms of debt are a drag on your monthly cash flow. Total all of those up and you’re looking at $1,000 every month that you aren’t able to save! Once you have it all paid off, that’s an extra grand every single month that you can invest towards your financial goals. That’s 1000 more little soldiers working for you! The key is to put a plan in place to pay off your debt as quickly as possible. My #1 recommendation is the debt avalanche approach. With this strategy, you list out each of your loans in order of highest interest rate to lowest. Then, you pay the minimum necessary on all except the loan with the highest rate. This allows you to pay off the loan that is building the most interest first. Once paid off, move your focus to the second highest interest rate loan. Repeat until all of your loans are paid off! Personally, I don’t count my mortgage in this category. Of course it is debt! But I’m talking about consumer debt and student loans. Once you’ve minimized your major expenses and made a plan to pay off your debt, the next place to look to cut expenses is all of the small stuff. 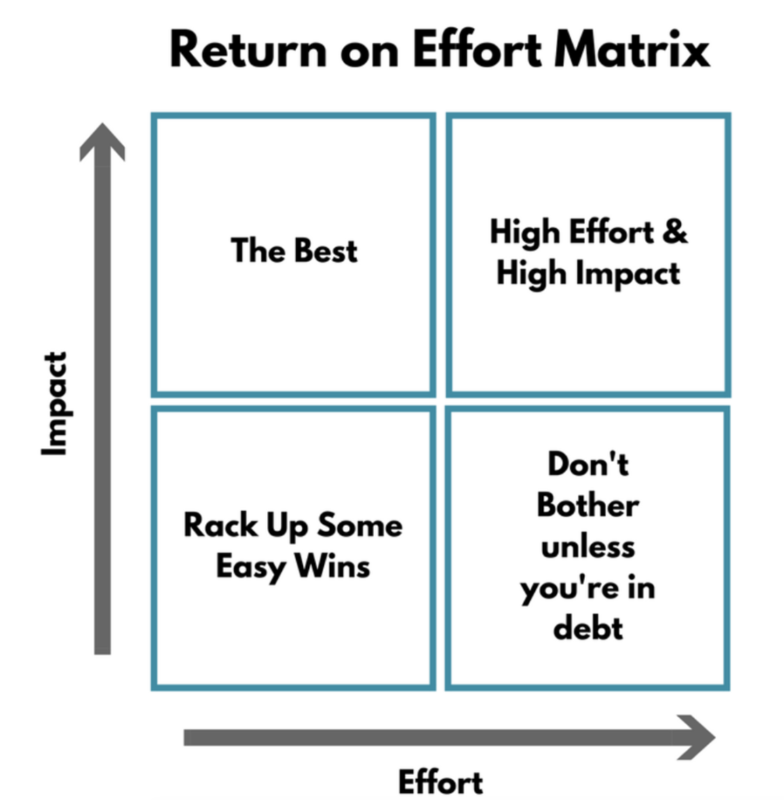 One useful framework for identifying budget wins is this Return on Effort Matrix. So take a look at your budget and figure out where the easy wins are. 1. One & Done: Canceling subscriptions, lowering a membership fee, or moving to a high-interest bank are good examples. 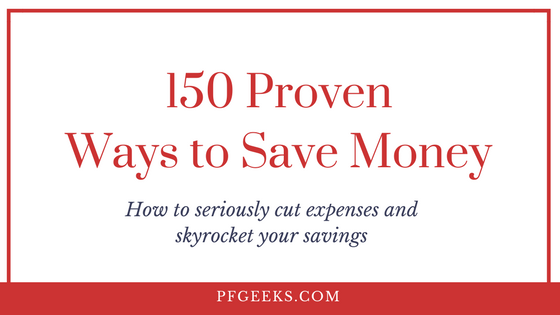 You put in the effort once and continually save money each month. 2. Easy & Repeatable: I love to look for small daily or weekly habits that don’t take much effort but save me decent money for the time invested. Making my own coffee each morning, shaving my head each week, and packing a lunch. Those 3 habits alone save me around $250/month. Saving money and growing your net worth is all about your ability to increase the amount of money you’re saving each month. Focus on growing your income, cutting expenses, and putting the surplus towards your financial goals. Get after it!